Posted 4/4/2016 10:38am by Ben Wenk. We agriculture types all got into this with our eyes wide open - well aware of the risks. We are forever at the mercy of our environment. Never more so than this spring. Let's get nerdy with the perilous effects of cold temperatures on bud growth, bud development, and bud mortality (knock on wood). First, let's go over crop specific data. We'll follow up with some caveats and other considerations. Please keep in mind this data is about 25 years old but we don't have any reason to believe that it's outdated. So, a lot of the development stage names are a bit jargon-y (save "full bloom") but it's easy to see by this chart, you don't wanna mess around with 28 F and lower which is exactly what we're facing here in spring 2016. 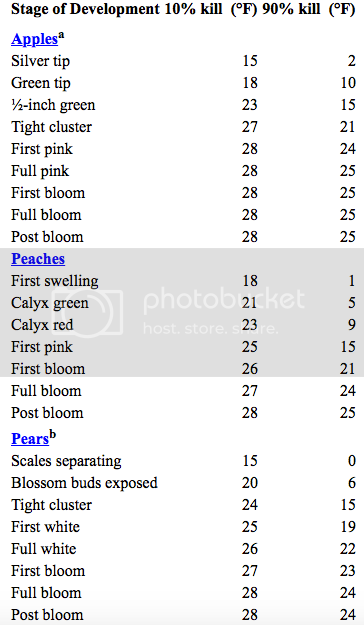 A few notes - the "general" rule of thumb is you'll lose 10% of any blossoms that are open for every hour the temperature is 28 or less. There are, of course, variety specific conditions and hardiness - some varieties of any fruit are genetic predisposed to withstand cooler temperatures. Wind can give you a little bit of relief - 28 and windy is better than 28 and dead calm, such that the cold air moving has a more diminished effect. There's also some evidence that suggests that repeated blast of cold air can improve the hardiness of a bud. Translation, again - that frequent blasts of cool air while the buds are swelling in the spring time can signal a response from the plant to "raise its defenses". As you can see, plants are in every way a lot smarter than we give them credit for. However, there are certainly cold weather events that you can't recover from no matter how "prepared" a tree might make herself. Additionally, for all you physicists out there, there's a little relief to be gained from the introduction of water to a cold night. Having a bud covered in ice will insulate it from the elements. While I wouldn't advise jumping in a pond for your own preservation when low temperatures risk your own mortality, it's an attractive option for fruiting buds. This will be the case ONLY if the buds are continuously wet. The temperature of that water would be 32 degrees while the water is making ice. There's also a little heat to be gained from this phase change since liquid water solidifying to ice is an exothermic reaction, meaning it releases heat. So it's common in freeze-prone areas to have irrigation set up for frost protection. One thing I didn't know about this practice until I read up on it for this entry is the effect of dew point. When the air is dry, the irrigation water will make the temperature plunge meaning it can be more harm than good if you get the job started too late. Of course, you'll need to keep the water running until the air temperature gets over 32 or so (morning) otherwise the results would be catastrophically opposite of what you intended! Certainly, this damage is not just limited to tree fruits. Blueberries, strawberries in addition to many other crops can be damaged by fluctuating temperatures. In a nutshell, plants are like humans - they do not like to be jostled frequently from slumber. The years in which temperatures get colder gradually in the fall and warmer gradually in the spring are the normal state of things and very comfortable for temperature fruit trees. While swings from seasonal norms between the months of December and April in the northern hemisphere are potentially damaging and, as always, ground temperature is sometimes as important as air temperature as the temperature of the soil has a huge effect on growth and acts as a heat (or cold) "sink" or battery, in a different way of thinking. The bottom line? This is no fun when we get to this point. READ MORE in Spring Frosts, vol. II!